MITT ROMNEY is a turnaround artist. At Bain Capital he seized faltering businesses too blind and bloated to mend themselves, restructured them, then took them public. 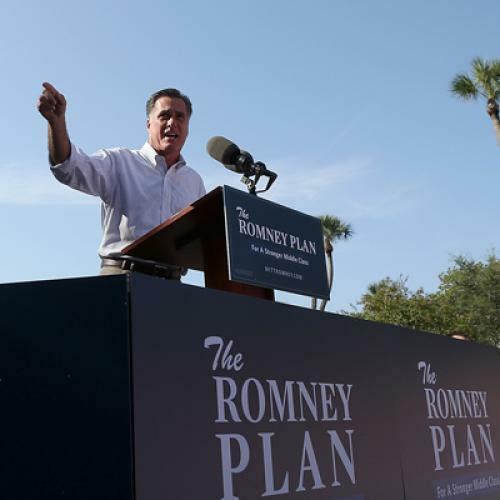 Now Romney wants to seize and restructure U.S. economic policy. The only difference is that the federal government is already public. Should we let him acquire it? An underlying nonpartisan truth is that no matter who becomes president, the economy won’t likely improve very quickly during the next four years. As an August Congressional Budget Office (CBO) report points out, downturns brought on by financial crisis—as the Great Recession was—are typically followed by unusually slow recoveries, with gross domestic product (GDP) depressed and unemployment elevated for at least a full decade after. The report also noted that recovery from any recession in which housing prices fall sharply (ring a bell?) will be slow and painful, because the housing market accounts for more than one-quarter of all U.S. investment. If that weren’t enough bad news, the ongoing euro crisis continues to pose significant danger to the U.S. economy. Then there’s Romney’s own “fairer, flatter, simpler” plan, which would lower all marginal rates by 20 percent, end much taxation on investment, and repeal the alternative minimum tax and the inheritance tax. There’s no point in even estimating the amount of additional stimulus this might produce, because it’s never going to happen. Even if Republicans take the Senate (a coin toss at the moment), Romney won’t have a sufficient margin to push it through. Presidents (alas) don’t have the option to lay off filibustering senators. Romney won’t identify which tax breaks he’d eliminate to pay for his cuts because they’re so big—the Tax Policy Center calculates they would shrink federal revenue by 24 percent. The only way he could cover the shortfall would be to go after the biggest and most popular tax expenditures, like the health insurance exclusion, the pension contribution exclusion, and the mortgage interest deduction. The Romney campaign whines that the Tax Policy Center study is biased against Romney (it isn’t), and cites a different study by Princeton economist Harvey Rosen (who couldn’t possibly be biased because he was chairman of President George W. Bush’s Council of Economic Advisers). But Rosen’s study assumes elimination of both the mortgage interest deduction and the health exclusion. Scaling these back or phasing them out over time might make good policy sense, but eliminating them all at once—to finance tax cuts for the rich!—would be politically impossible, not to mention financially disastrous, especially to the already-depressed housing market. Probably Romney, in addition to extending Bush’s tax cuts, could push through a (far more modest) trickle-down tax cut of his own. But it wouldn’t be this one. Whatever stimulus Romney’s tax cuts might produce, much (perhaps all) of it would be wiped out by his monetary policy. The investment class tends to favor the highest possible interest rates (high interest = high return), and Romney is no exception. Romney has said he won’t reappoint Fed Chairman Ben Bernanke in 2014 because he thinks Bernanke is insufficiently committed to maintaining “a strong dollar.” Paul Ryan is an even bigger inflation hawk than Romney—during the recession he actually sponsored a bill directing the Fed to stop taking long-term unemployment into account when making monetary policy—and would likely exert some influence here as well. Romney “could be expected to have more conservative governors under him,” says economist Gary Burtless of the Brookings Institution. So even if Romney let Bernanke stay, the Fed would be much less free to pump money into the economy to boost (shhh!) employment. If any of Romney’s tax stimulus remained, it would be erased by cuts in government spending. Romney proposes capping federal spending at 20 percent of GDP, which (according to the Center on Budget and Policy Priorities) would mean a $688 billion reduction in government spending. There’s no chance the Senate would give him that, especially since Romney also wants to nearly double defense spending over the next ten years. Let’s be generous and assume Romney achieves half—$344 billion in spending cuts. That would still amount to more than half the size of the “fiscal cliff” that CBO says will, if not averted, put the economy back into recession. At this point it’s fair to conclude Romney’s machinations would actually be worsening the economy. The single biggest drag on economic recovery is the foreclosure crisis. President Obama’s debt-relief plan has been halfhearted and inadequate (though during the past year it’s gotten a bit more effective). But at least Obama has a plan. Until recently, Romney’s stated position was, “Don’t try to stop the foreclosure process.” Now he says the government must “facilitate foreclosure alternatives for those who cannot afford to pay their mortgage,” but he won’t say how. My guess is that Romney would do nothing. Bain Capital’s onetime chairman is temperamentally unable to put deficit reduction ahead of lower taxes; to care at all about inequality (a former Bain partner recently published a book saying we need more of it); or to enforce the Dodd-Frank Wall Street reforms (undoing “the limited regulations we have,” Freeman says, could presage “another financial collapse”). Those are all longer-term problems less susceptible to quick solutions, but Romney would make them worse. If you’re counting on a future at this firm, I recommend you do all you can to block Romney’s leveraged buyout. Timothy Noah is a senior editor at The New Republic. This article appeared in the October 4, 2012 issue of the magazine.